My Grandfather, William Robert Silvestri (Bill), at the age 17 enrolled in the United States Navy. In only his first few months of duty lies a heroic war story, one that deserves a proper accounting for our family’s records. I’ve pieced together the details of that story below, as a gift to my family on the one year anniversary of his passing. It’s the night of October 24, 1944, in the midst of WW2. Bill lay asleep on board his ship, the U.S.S. LST-695. 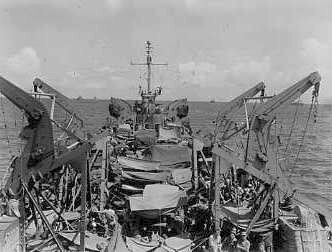 Just one day earlier the crew had finished unloading army equipment in White Beach, Leyte and were now anchored in San Pedro Bay en route to the Philippines. Grandpa Bill’s ship beached while unloading on October 22, 1944 in San Pedro Bay, White Beach, Lyete, P.I. Grandpa’s ship en route to the Philippines on October 22, 1944. The surviving sailors rigged these rough awnings to shield them from the tropical sun. The damage lay chiefly around frame 57 on or near the rudder post as the explosions had vented upward, blowing a hole about 15 feet wide and 32 feet long, bending the skin of the ship upward around the hole and buckling the hull between frames 31 and 32, forward of the direct damage. In addition, the powerful force of the explosion had blown each deck into the deck above, raising the whole fantail two feet. A large number of officers and men under Lt. Stevens “set about recovering the wounded and dead” from the “totally wrecked” after crew’s quarters: Lt. Joseph F. White, Jr., D-V(S), the gunnery officer, Ens. Harry D. Hendren, D-V(S), the assistant first lieutenant, MoMM3c Edgar R. Snider, RdM3c Leland G. Morlan (who had suffered back injuries), F1c Samuel L. Mowder, S1c John S. Strzelczyk (who had suffered a fractured right arm), Cox Leonard C. Herm (who had suffered contusions to his nose and back, and multiple lacerations to his feet) and F1c John L. Hensley, all plunged into the wreckage, heedless of their own safety (each of the foregoing men would receive the Bronze Star for their meritorious service). The survivors abandoned ship and began to tread water. Meanwhile, a control party of 3 engineers made their way into the “darkened and flooded” areas “taking all steps to assure water tight integrity and to estimate the damage done.” After 15 minutes, they concluded that the ship would not sink assuming weather conditions remained calm. Each of those 3 engineers would receive a Silver Medal for their courageous service. Bill and his fellow sailors board ship to treat the wounded; One medical doctor was killed during the explosion and another was severely injured. While patrolling the water for casualties, some men were recovered after being blown over the side of the ship by the explosion. “exemplary conduct and devotion to duty.” In the immediate wake of the attack, “when there was imminent danger of further enemy action (a possibility of foundering many miles off shore, and when many) shipmates were dead and dying” her men had rendered assistance when it was badly needed and conducted themselves most creditably. While in tow, the severely wounded were transferred first to another ship and then, by army vehicle, traveled to the U.S. Naval Hospital on Peleliu. Meanwhile, the sailors worked to make the ship more livable. With its two electric refrigerators rendered unusable and little fresh water, the men survived on canned goods. On a side note, later in life my Grandfather detested pineapples due to surviving off of them during that time. One day later, on October 26, the ship prepared for burials at sea. Conducting the service at the conclusion of the afternoon watch, Lt. Freeman recited the prescribed texts for both Protestant and Roman Catholic faiths, “committing the bodies of the slain to the deep (07°15’N, 131°57’E).” LST-695 and her crew buried 22 of their dead. On October 28, the battered ship docked at Kossol Roads. On November 1, as salvagers cleared away the twisted debris at the ships head, one body was located and identified as one of the missing. A funeral party consisting of 2 lieutenants and 10 sailors from LST-695 made their way out to sea to “consign the body of their shipmate to the deep.” They would remain at Kossol Roads until the end of January, 1945 while the ship underwent repairs. Bill and his fellow corpsmen would witness two more Japanese submarine attacks on January 23, 1945 and on April 29, 1945, neither of which resulted in casualties or damage to their ship. Grandpa Bill’s ship on April 11, 1945 entering Advance Base Sectional Dock at Manus, Admiralty Islands. At the end of that period [18 April 1945], about 150 miles east of Okinawa, destroyers Heermann (DD-532), McCord(DD-534), Mertz (DD-691), and Collett (DD-730), assisted by destroyer Uhlmann (DD-687) and a General Motors TBM (VT-47) Avenger from the small carrier Bataan (CVL-29) sank I-56 with all hands (116 officers and men and 6 embarked Kaiten pilots). On June 25 they began their journey across the Pacific receiving a tow from LST-130 from Pearl Harbor, Hawaii. It wouldn’t be until July 11, 1945, more than 8 months after that dreaded attack, that they would return home to San Francisco Bay, California. Bill was awarded the Purple Heart due to his gallantry and the many injuries he sustained during the attack. He went on to serve 22 years in the United States Navy, working his way from a Baker’s Assistant to Head Chef, retiring with the rank of Chief Petty Officer (the highest rank awarded to men with his level of education). Today, it’s been one year since Grandpa Bill left this world. Yet his legacy lives on. He is survived by 3 children and their spouses, 7 grandchildren and their spouses, 10 great grandchildren, 2 brothers and 2 sisters. Grandpa Bill, Retired Navy Chief, Served as Head Chef in the United States Navy. An awesome cook! A special thanks to my Grandmother, Bonnie Silvestri, for sharing her version of this story with me, which was dictated to her by Grandpa Bill. I also uncovered many details from the Naval History And Heritage Command website, which served as my source for this article, NHHC LST-165. For another true story, read Our Fertility Journey & Birth Story. So special and meaningful. This touched me and made me realize once again how much I miss him. thank you.I love you Lindsay. Thank you for the the amazing story. I’m glad you enjoyed it. Thank you for taking the time to read it! I did enjoy it and you are welcome. We must remember the people we loved and loved us. Thank you for sharing. Had heard parts but not all the details, pics. Very moving. 💟 Please send my Love and a hug to Mrs. Silvestri and Cheryl for me. Thank you for reading Bruce! Hugs! Hi Craig, thank you so much for stopping by and reading! Also, thank you for creating a page dedicated to the LST-695. I’m so grateful to join the group and participate in it’s history as my Grandpa would be so proud!